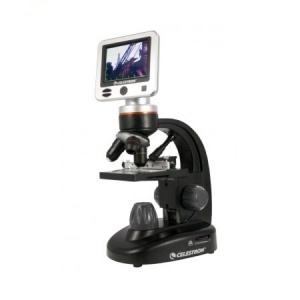 The LCD Digital Microscope II is a professional biological microscope at an affordable price. Change powers from 40x to 100x to 400x (up to 1600x with digital zoon) with a turn of the 3-position rotating lens turret. The large 3.5" Color LCD screen display rotates 180 degrees so you can easily share your viewing with others. For an even bigger audience, you can use the TV output to display on a television or projector. With a bult-in true 5MP digital camera and included 1GB SD card, it's never been easier to capture stunning images and transfer them to your PC.